Gardenfield House B&B, high quality bed & breakfast accommodation, located at Merlin Park on the Eastern / Southern entrance to Galway City. The accommodation is luxurious in style and decor and each room is complete with en-suite, television, hairdryers, telephone and coffee/tea making facilities are available on request. 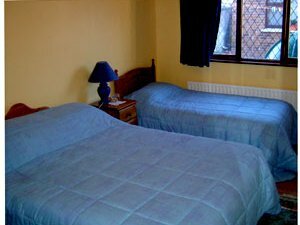 All our rooms are en-suite with tea & coffee making facilities, multi channel TV & hairdryers. Our tariff is between 35 - 50 for a single and 65 to 100 EUROS for double room. Our breakfast menu is delightful and prepared fresh each morning from 8:00am to 9.30am. Galway the 'city of the tribes' is a costal town located on the West coast of Ireland's peninsula. It is the largest city in the west coast of Ireland. The city has not lost its charm openness and integrity that enchants visitors. Its winding medieval streets enlivened with buskers, Galway has changed over the years, been revitalised, polished, painted and flower bedecked - with ambivalent feelings. Another gem in Galway's crown is the little seaside village of Salthill 2km away where Galway Bay can be seen in its loveliest shades of blue and green, gently lapping against the beach with the Clare hills smudged like an impressionistic painting in the morning mist along her horizon. The famous Aran Islands located 30KM from the coast of Galway city is a must on a visit to the west. Each year as winter is barely over, Galway slips into party form. From the city's February music festival to the two Oyster Festivals which close the season in September the parties continue at the rate of at least one a month. These events cover everything from racing to literature, taking in country music, all kinds of arts and of course, lots of oysters on the way. When it comes to sports, Galway men and women always feature in the national final stages in both hurling and Gaelic football - this is a welcome boast to the city and creates a marvellous party atmosphere win lose or draw! We accept most major international cards including Mastercard, Visa & Laser. We are located on the main Dublin N6 approach road into Galway we are between Merlin Park Hospital and the Corrib great southern hotel in a quite cul-de sac called 'Woodhaven' we are house number 5 first on the left as you drive into the cul-de-sac.